Discovery Casts Doubt on 'Hobbit' Theory Researchers say that skeletal remains discovered on the islands of Palau suggest that the so-called "hobbits" found several years ago in Indonesia may have been dwarf humans, not a separate species as previously thought. The discovery of unusual skeletal remains on the islands of Palau suggests that the so-called "hobbits" found several years ago in Indonesia may have been dwarf humans, not a separate species. Researchers report that they discovered parts of human skeletons between 900 and 2,800 years old in caves on the Pacific islands of Palau. 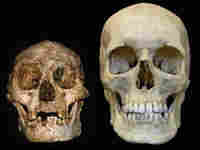 The researchers say that the remains, though quite small, are clearly those of modern humans. A population living in isolation, as on an island, can develop "insular dwarfism," the researchers say. The newly found remains are similar to those found on the island of Flores several years ago, but the researchers cannot say definitely that similar factors are at work in both sets of remains. Lee Berger, one of the authors of the new study published in PLoS One, talks about the work.